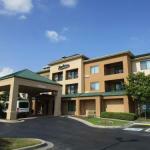 The 87-room Courtyard by Marriott Houston Intercontinental Airport is seven miles from Bush Intercontinental Airport and provides affordable accommodation to suit both the business and leisure traveler. The three-story, non-smoking hotel is a few blocks from several major Houston corporations including Exxon Mobil, Halliburton and Kerr McGee. Items included with the room rate are high-speed Internet access, parking, local telephone calls, a morning newspaper and coffee available in the lobby 24/7. The hotel is a short drive from Minute Maid Park, home of the Houston Astros and Reliant Park, home of the Houston Texans. Other area landmarks and attractions include three golf courses, The Galleria shopping mall, Houston Zoo, the NASA Space Center and horseracing at the Sam Houston Raceway Park. All the guestrooms, and three suites, have a work desk with high-speed Internet access, cable television with movie and news channels, pay-per-view movies, wet bar, alarm clock, tea and coffee making facilities, iron and ironing board, pullout sofa bed, hairdryer and two-line telephone with voicemail and speakerphone. This hotel has an indoor swimming pool, whirlpool and a fitness center. The Courtyard Café is open for breakfast every day and serves dinner on Monday through Thursday nights. Room service is available in the evenings from 5pm until 9.30pm. Restaurants nearby include Jimmy Gs, TGI Fridays and Pappasitos. The 24-hour front desk has safe deposit boxes and information on area events and attractions. Other amenities include copy and fax services, a coin-operated laundry, vending machines and valet dry-cleaning.